Variable speed control of AC electrical machines makes use of forced-commutated electronic switches such as IGBTs, MOSFETs, and GTOs. Asynchronous machines fed by pulse width modulation (PWM) voltage sourced converters (VSC) are nowadays gradually replacing the DC motors and thyristor bridges. With PWM, combined with modern control techniques such as field-oriented control or direct torque control, you can obtain the same flexibility in speed and torque control as with DC machines. This tutorial shows how to build a simple open loop AC drive controlling an asynchronous machine. Simscape™ Electrical™ Specialized Power Systems contains a library of prebuilt models that enable you to simulate electric drives systems without the need to build those complex systems yourself. For more information about this library, see Electric Drives Library. The Machines library contains four of the most commonly used three-phase machines: simplified and complete synchronous machines, asynchronous machine, and permanent magnet synchronous machine. Each machine can be used either in generator or motor mode. Combined with linear and nonlinear elements such as transformers, lines, loads, breakers, etc., they can be used to simulate electromechanical transients in an electrical network. They can also be combined with power electronic devices to simulate drives. The Power Electronics library contains blocks allowing you to simulate diodes, thyristors, GTO thyristors, MOSFETs, and IGBT devices. You could interconnect several blocks together to build a three-phase bridge. For example, an IGBT inverter bridge would require six IGBTs and six antiparallel diodes. To facilitate implementation of bridges, the Universal Bridge block automatically performs these interconnections for you. Follow these steps to build a PWM-controlled motor. Type power_new at the command line to open a new model. Save it as power_PWMmotor. Open the Power Electronics library and copy the Universal Bridge block into your model. Open the Machines library. Copy the Asynchronous Machine SI Units block into your model. Setting the nominal power to 3*746 VA and the nominal line-to-line voltage Vn to 220 Vrms implements a 3 HP, 60 Hz machine with two pairs of poles. Its nominal speed is therefore slightly lower than the synchronous speed of 1800 rpm, or ws= 188.5 rad/s. Set the Rotor type parameter to Squirrel cage, and note that the three rotor terminals a, b, and c are not accessible, because during normal motor operation these terminals should be short-circuited together. Connect a Bus Selector block at the measurement output of the machine. When this block is connected to a machine measurement output, it allows you to access specific internal signals of the machine. Select the following signals: Stator measurements.Stator current is_a (A), Mechanical.Rotor speed (wm), and Mechanical.Electromagnetic torque Te (N*m). You now implement the torque-speed characteristic of the motor load. Assume a quadratic torque-speed characteristic (fan or pump type load). The torque T is then proportional to the square of the speed ω. 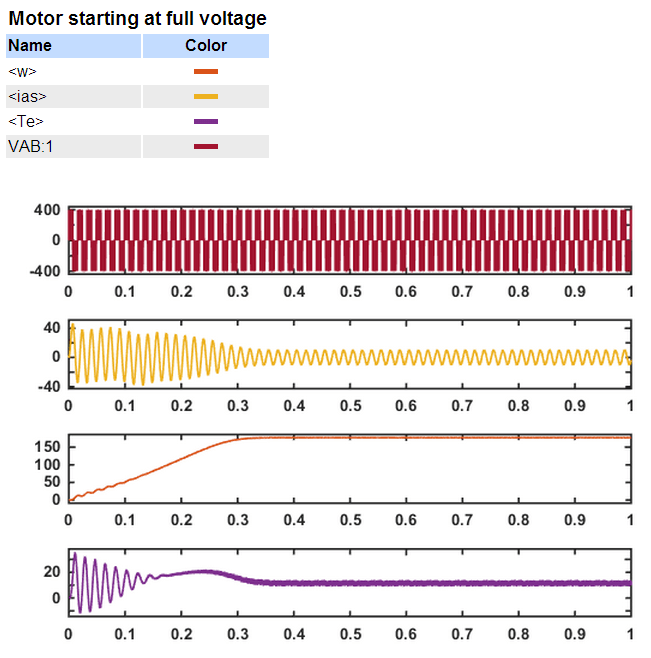 Open the User-Defined Functions library of Simulink® and copy the Fcn block into your model. Open the block menu and enter the expression of torque as a function of speed: 3.34e-4*u^2. Connect the output of the Fcn block to the torque input of the motor, labeled Tm. Open the Electrical Sources library and copy the DC Voltage Source block into your model. Open the block menu and set the voltage to 400 V.
Open the Measurements library and copy a Voltage Measurement block into your model. Change the block name to VAB. Using a Ground block from the Elements library, complete the power elements and voltage sensor interconnections as shown in the diagram of the power_PWMmotor model. Open the PWM Generator (2-Level) block dialog box and set the parameters as follows. The block has been discretized so that the pulses change at multiples of the specified time step. A time step of 10 µs corresponds to +/- 0.54% of the switching period at 1080 Hz. Therefore, a DC voltage of 400 V and a modulation factor of 0.90 yield the 220 Vrms output line-to-line voltage, which is the nominal voltage of the asynchronous motor. You now add blocks measuring the fundamental component (60 Hz) embedded in the chopped Vab voltage and in the phase A current. Open the Control and Measurements library of the simscapepowersystems_ST library and copy the Fourier block into your model. Connect this block to the output of the Vab voltage sensor. Duplicate the Fourier block. To measure the phase A current, you connect this block to the Stator current is_a output of the Bus selector block. Stream these signals to the Simulation Data Inspector: the Te, ias, and w signals of the measurement output of the Asynchronous Machine block, and the VAB voltage. Set the stop time to 1 s and start the simulation. Open the Simulation Data Inspector and look at the signals. Also notice strong oscillations of the electromagnetic torque at starting. If you zoom in on the torque in steady state, you should observe a noisy signal with a mean value of 11.9 N.m, corresponding to the load torque at nominal speed. If you zoom in on the three motor currents, you can see that all the harmonics (multiples of the 1080 Hz switching frequency) are filtered by the stator inductance, so that the 60 Hz component is dominant. 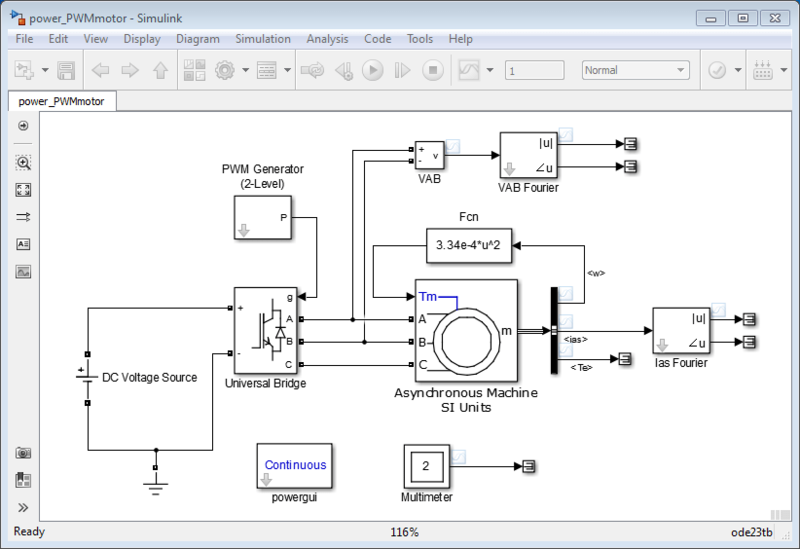 Open the Universal Bridge dialog box and set the Measurement parameter to Device currents. Copy the Multimeter block from the Measurements library into your circuit. Double-click the Multimeter block. A window showing the six switch currents appears. Click Close. The number of signals (2) is displayed in the Multimeter icon. Send the signal from the Multimeter block to the Simulation Data Inspector. Restart the simulation. The waveforms obtained for the first 20 ms are shown in this plot. As expected, the currents in switches 1 and 2 are complementary. A positive current indicates a current flowing in the IGBT, whereas a negative current indicates a current in the antiparallel diode. Multimeter block use is not limited to the Universal Bridge block. Many blocks of the Electrical Sources and Elements libraries have a Measurement parameter where you can select voltages, currents, or saturable transformer fluxes. A judicious use of the Multimeter block reduces the number of current and voltage sensors in your circuit, making it easier to follow. You might have noticed that the simulation using a variable-step integration algorithm is relatively long. Depending on your computer, it might take tens of seconds to simulate one second. 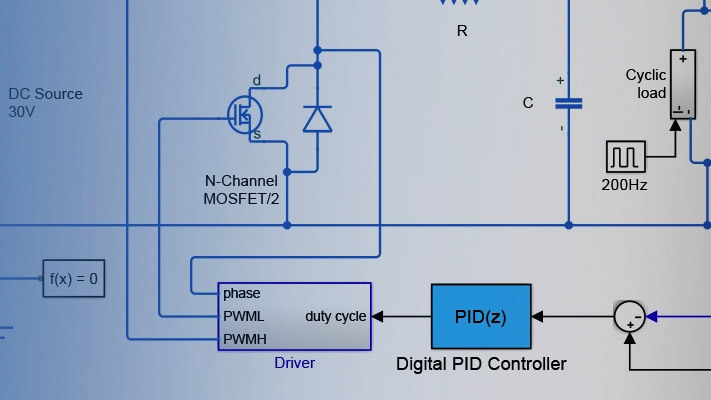 To shorten the simulation time, you can discretize your circuit and simulate at fixed simulation time steps. In the Simulation > Configuration Parameters > Solver dialog box, select the Fixed-step and Discrete (no continuous states) options. Open the powergui block and set Simulation type to Discrete. Set the Sample time to 10e-6 s. The power system, including the asynchronous machine, is now discretized at a 10 µs sample time. Start the simulation. Observe that the simulation is now faster than with the continuous system. Results compare well with the continuous system. The two Fourier blocks allow computation of the fundamental component of voltage and current while simulation is running. If you would like to observe harmonic components also you would need a Fourier block for each harmonic. This approach is not convenient. Add a Scope block to your model and connect it at the output of the VAB Voltage Measurement block. In the configuration properties of the Scope block, go to Log data to workspace > Save format and select Structure With Time. Start the simulation. Now use the FFT tool of powergui to display the frequency spectrum of voltage and current waveforms. The analyzed signal is displayed in the upper window. Click Display. 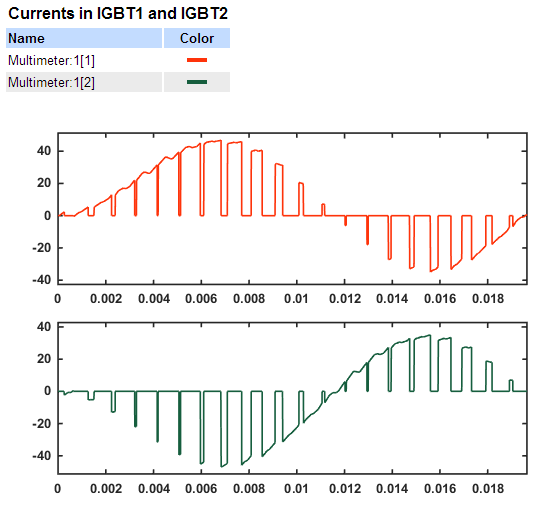 The frequency spectrum is displayed in the bottom window, as shown in the next figure. The fundamental component and total harmonic distortion (THD) of the Vab voltage are displayed above the spectrum window. The magnitude of the fundamental of the inverter voltage (312 V) compares well with the theoretical value (311 V for m=0.9). Harmonics are displayed in percent of the fundamental component. As expected, harmonics occur around multiples of carrier frequency (n*18 +- k). Highest harmonics (30%) appear at 16th harmonic (18 - 2) and 20th harmonic (18 + 2).